FILE - Adviser to Pakistan's Prime Minister on National Security and Foreign Affairs Sartaj Aziz listens to a question during a news conference with Iranian Foreign Minister Javad Zarif at the Foreign Ministry in Islamabad, April 8, 2015. Afghanistan's suspended Taliban peace talks appear no closer to resuming following recent meetings between senior Afghan and Pakistani officials in Kabul. In interviews and speeches recently, leaders on both sides insisted their counterparts have more work to do to build mutual trust before they can restart the negotiations. Sartaj Aziz, Pakistan's national security adviser, said his primary mission in Friday's meetings in Kabul was to address what he called “anti-Pakistan sentiment” in the Afghan government, which he said had “spoiled the atmosphere” for holding another round of peace talks. “We of course agreed readily and said we are virtually twins and we have to live amicably with each other and we must try to defuse the situation and restore our trust and confidence," Aziz said. Aziz told VOA Afghanistan leaders appeared less keen to resume peace talks with the Taliban after negotiations broke off in July when it was revealed Mullah Omar, the longtime leader of the insurgent group, had died two years ago. He said Afghan authorities will let Islamabad know “in the coming days” whether the time is right for resuming talks. 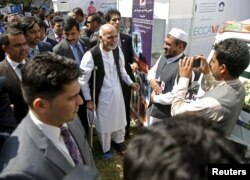 FILE - Afghan President Ashraf Ghani, center, talks to participants at an exhibition of Afghanistan products during the Regional Economic Cooperation Conference of Afghanistan (RECCA) in Kabul, Afghanistan, Sept. 4, 2015. ​Those negotiations, the first official contact between the government and the Taliban in 14 years, were brokered and hosted by Pakistan and included Chinese and U.S. representatives. Since then, there have been public splits in the Taliban ranks over who should be the next leader of the insurgent group. The Taliban has appointed Mullah Akhtar Mansoor as Omar’s successor, but the move has led to a split in the group and the tension has even promoted deadly clashes with those refusing to pledge allegiance to Mansoor. Senior Afghan officials also have alleged Islamabad is behind the latest spike in Taliban attacks, undermining Islamabad's role as a facilitator for the talks. The Haqqani network of insurgents fighting alongside the Taliban is blamed for the recent deadly bombings in Kabul, and Afghan officials insist the militants planned the bloodshed in sanctuaries across the Pakistani border. Aziz said Pakistani officials have found no evidence for the claim and the bulk of the Haqqani network is in Afghanistan. "There may be some people here (in Pakistan) and we can certainly deal with them, and once the reconciliation begins and if they (Haqqanis) are an important element with the Taliban, then getting them on board will be important. But how do we do that still remains to be seen," he said. Speaking to a meeting of Afghanistan’s foreign donors in recent days, President Ashraf Ghani, in a veiled reference to Pakistan’s security establishment, said the leaders in the neighboring country want to promote peace but there are “forces” there that continue to seek a weak and insecure Afghanistan. “Provided that we have a willing partner, peace discussions will have advanced and a serious dialogue to end the killings be under way," Ghani said. In a nationally televised speech Sunday night, Pakistan military chief General Raheel Sharif spoke about the issue and expressed “serious concern” over what he described as the aggravating security situation in Afghanistan. He asserted that Pakistan has “strong historical and blood ties with Afghanistan and no power on Earth can disrupt this relationship." Afghan and U.S. officials accuse the Pakistani military of maintaining ties to the Haqqani network for it to be able to exert influence over happenings in Afghanistan and keep rival India from extending its role in the war-torn nation -- charges Islamabad rejects as policies of the past it has long abandoned.